In fact, my drive to get things DONE is excalating. 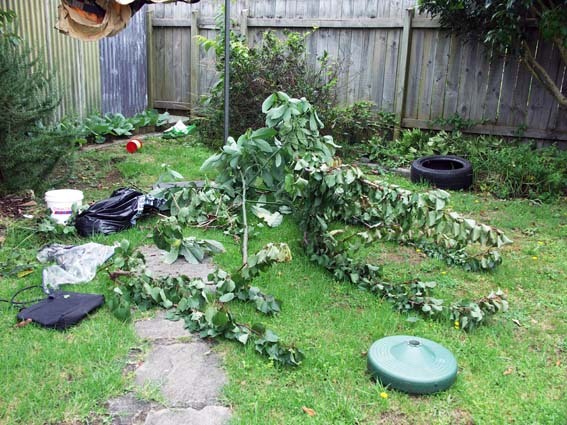 At first glance it looks as though I've created a huge mess, when actually this is the result of my efforts to free my rotary clothes line (windy-drier) from the surrounding trees. Yup, I was up with the birds this morning sawing off branches. It all started with my father. He didn't tell me it was the wrong thing to do per se, just gave me a very confused look whenever he saw one of the packets. 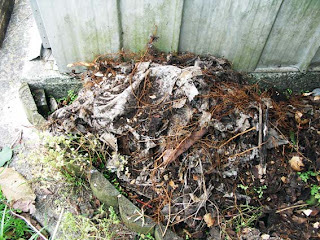 So, this morning, I decided to free the compost bin that we inherited from the previous tenants (it had a tree growing out of it...) and while I had the handsaw in the general vicinity, I carried on sawing. 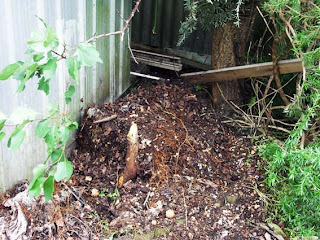 As you can see, I did manage to free the compost bin and move it. This was it's previous spot - see the little stump? My mother just informed me that it was an avocado tree. Anyway, the reason I haven't attempted to use the compost bin up until now is because some bright spark who lived here previously obviously decided to see just how biodegradable disposable nappies are - and filled the bin with them. I've lived here two years now and they still haven't broken down. But other than that disgusting sight - this is what the bin had so far produced. 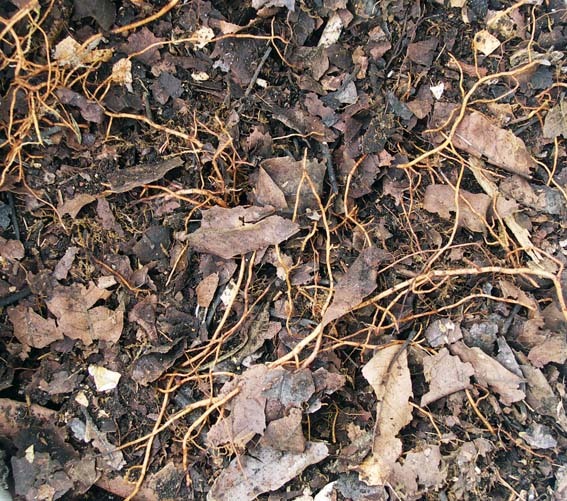 And then added a thin layer of the old compost as a bit of a starter. And then went hunting for the packets that The Jord had hidden. I'd say it was like a treasure hunt, but it really wasn't, the contents of some of those packets were slimy and smelly - not treasure just yet! I'll spare you a photo of that. Needless to say I added another layer of leaves after putting the slimy scraps in, just to try and contain the smell! 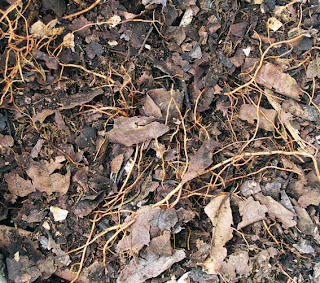 Any other tips for getting a good compost started? We used to use discarded tyres at the bottom of the garden. 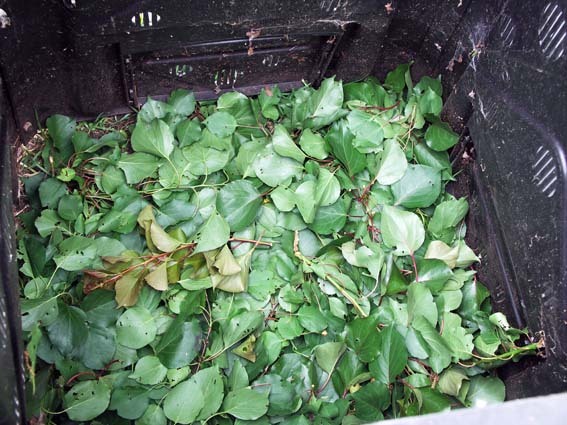 When filled with heat-producing leaves, plus the air that got to them under the tyre, the process was well away. 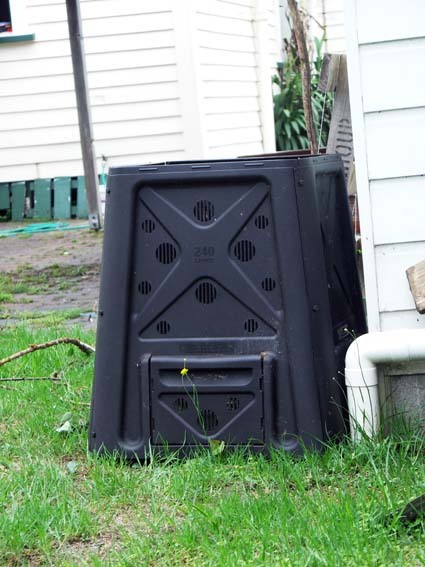 But you also get worm farms these days that have storeys to their wee hoosies so that worm poo/wee can dribble down and collect so that you can tap it and use it in your garden. I'll open the kiwi franchise! 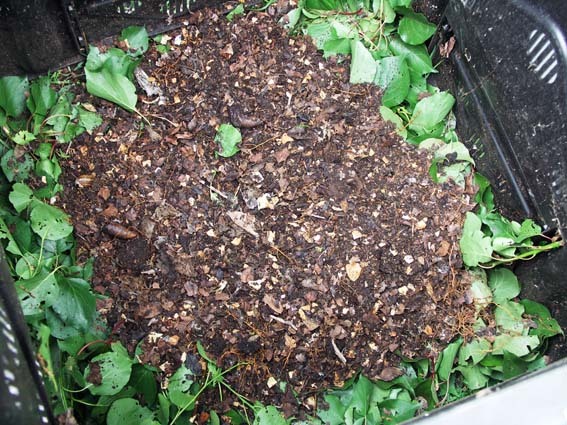 My PeeMen are very productive in my garden ;) Apparently one of the ingredients for good compost is urea. I didn't take science or chemistry or biology in school but surely it's the same thing?